This was after it had been genetically modified to resist the pest - Maruca Vitrata. According to a press statement released by the National Biosafety Management Agency on Tuesday, the approval was contained in a 'decision document' issued by NBMA. "IAR in partnership with the African Agricultural Technology Foundation (AATF) commenced the research to address the deadly Maruca Vitrata attacks on beans in 2009 after series of efforts to use conventional breeding methods failed to produce results. "After 10 years of extensive research, government has deemed it fit to introduce the crop variety into the nation's agricultural seed system having met all regulatory stipulations and scientific procedures. 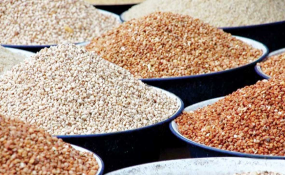 "The introduction will address the national cowpea demand deficit of about 500,000 tonnes and also improve the national productivity average of 350kg/hectare." He said the decision to venture into genetic modification in cowpea breeding was as a result of pest infestation "that has over the years made cowpea farming difficult". "Cowpea is the most important food grain legume in Nigeria. The low yield of the crop in Nigeria is due to many constraints particularly pod boring insects which cause up to 90 per cent yield loss in severe infestation cases," he said. The Acting Director General, National Biotechnology Development Agency (NABDA) Alex Akpa, said with the approval, Nigeria has registered her name in the global scientific community "as a country capable of finding solutions to her challenges". "After 10 years of laboratory work and on-field trials, Nigerian scientists have developed its first genetically modified food crop, the PBR Cowpea. We are proud to be associated with this noble development," Mr Akpa said.